I sat in the back of the car wondering where my Mum and I were going, she finally told me to get out, I asked her where we were and she told me we were at a horse market! My mind was spinning, I was so excited, I had always wanted a horse, now I was getting one! I had kind of hinted that I wanted one but not much, I love my Mum! My Mum started walking and told me to hurry up so I snapped back into reality while catching up with her. As soon as I walked in I was amazed, so many beautiful horses and cute ponies. My Mum asked whether I wanted a horse or pony and I said it didn't matter so we kept walking. 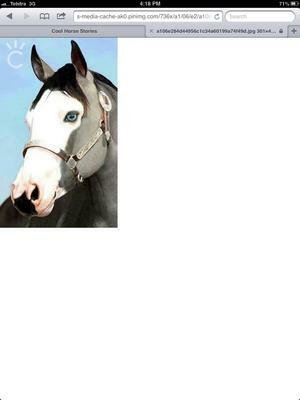 I saw greys, bays, buckskins, paints, blacks and palominos all of which were utterly beautiful but I stopped and stared at this one paint with crystal blue eyes, grey+white splotches, and a white face.I immediately loved this one horse, loved the eyes and everything about her she was my wish.Mum had obviously seen me because she said "I guess you choose this girl, have you thought of a name?" "Wish." I said suddenly, it just seemed perfect. "I love you Wish" "I will take care of you I promise, I hope you have a good time with all the trail rides and care, let's go." They were walking out to the car when I had realised that their was a horse trailer on the back of the car and I finally realised I was completely happy. Is it a true story? Did you get Wish...or are you still wishing?